After your salvation, what next? As I`ve read Matthew`s gospel recently I was freshly impacted with the great commission, today`s Scripture. As human beings, we don’t only need discipline in our lives, but relationship with Jesus, in order to live fruitfully. What better goal in life than to make a heart choice to submit ourselves to the discipline of Jesus - to become His disciple. This is so much more than being just a believer and involves making radical choices in our life to prioritise our walk with Jesus. We need to get around other like minded Christians and commit to be a truth seeker and make that deep choice to pay the cost associated with these choices. In a world where financial investments across the globe falter and where political and financial leaders, as part of our societies, have degrading moral centres, what better and safer investment could you possibly make? I recently saw a documentary in the cinema about the world financial market collapse of 2008. It was fascinating to learn of the build up to this event as over recent decades the financial sector had their boundaries or disciplines effectively removed. This paved the way for this modern world with its rapidly decaying morals to express itself in a new way. The entire world population was oppressed in order to create more billions of wealth at the top. Dodgy dealings wiped out ordinary people’s savings and caused many home to be re-possessed, while the dealers earned huge rewards for their work. How true it is that people with power and without discipline wreak havoc, as the world continues to abandon not only faith in Jesus but the societal systems which were based upon Christian faith. Prayer: Lord Jesus, thank You that You are my security, my protector and my provider and no matter what the world may have taught me throughout my whole life You are the one who made me, sustains me and loves me. Please help me to make wise choices about how I invest the resources you give me and lead me in your good and perfect will for my life. Thank You that no matter how many banks around the world may falter you never will. In Jesus’ name, Amen. 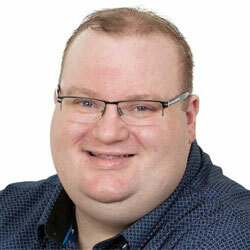 Richard Fila has a background in IT Consultancy and Accountancy Practice. He first came to know Ellel Ministries at Ellel Grange in 2006 and has since attended the NETS school at Ellel Pierrepont. He is now based at the head office at Ellel Grange managing the portfolio of Ellel Ministries websites and the supporting technologies.